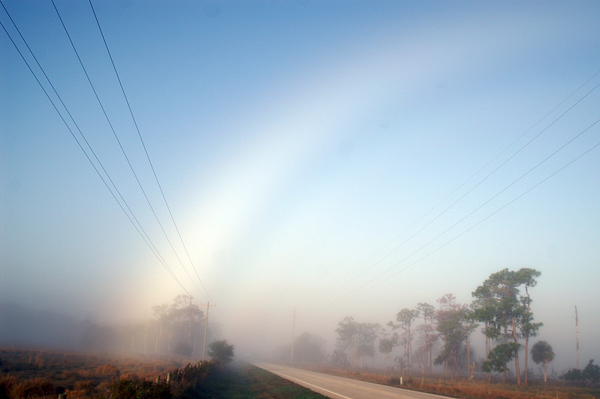 One morning when I was doing a Caracara survey, I suddenly realized that a fog bow had formed. I had never seen one before and was a bit confused, but I took photos. Later in the day, I compared notes with others involved in the survey and a number of people had seen them. This entry was posted on Thursday, April 19th, 2012 at 2:16 pm. It is filed under Environment, Landscape, Nature, New Images and tagged with arch, bow, clouds, fog, fog bow, morning, sun. You can follow any responses to this entry through the RSS 2.0 feed.